Is my work worth the prices I ask? Do people actually like me? Or do they wish I’d just go away? And, of course, these issues aren’t always plaguing me all the time. There are times when I feel good about most of these things, and times when only one issue is causing me a problem, and (the worst) times when all of my issues pile on me and I feel like a horrible failure. Self-confidence, though, is essential if you want to move forward with your life and career. Studies indicate that self-confidence is one of the best ways to advance your career. Not only that, but self-confidence can also help you in your relationships, and provide you with a feeling of purpose and enhance positivity in your life. One of the biggest hits to self-confidence is the idea that you need something to be “perfect” in order for it to be worthwhile. I once heard J.D. Roth, in a keynote address at a conference, talk about how perfect is the enemy of good. I’ve seen this theme repeated in other settings as well. Trying to achieve perfection is setting you up for failure. While you can always improve, and while progress should be your goal, don’t assume that you have to be perfect, or execute something perfectly, in order to matter. If you feel you aren’t good enough, take a step back and look at your progress. Are you better than you were last year? If so, that’s good. If you can measure your progress, and acknowledge how far you’ve come, as well as recognize that you are still trying to become better, then you will be more likely to feel self-confidence. Focus on the good, rather than becoming obsessed with perfection, and you’ll get more done, and find reasons to feel confident about your efforts. One of the reasons my self-confidence often takes a hit is that I have unrealistic expectations. This is especially true when I battle my weight. Often, I exercise and eat right, following a regimen that I don’t particularly enjoy. So I become frustrated when, after a week, my arms are still flabby, and I’ve only lost a pound. It’s not realistic to expect to reach your goals — no matter what they are — immediately. My problem is that after I’ve done what I should, and it takes a longer time to reach my goals, I often binge, or stop exercising. I’m not confident that I will get the results I want, because I’ve been unrealistic, and then I get impatient and give up. Then I regress, and feel even worse about myself. Building my self-confidence requires that I get realistic about my goals and the timeframe involved and, once again, focus on my progress (no matter how small) rather than freaking out about what’s going wrong. I struggle with this. I see how other mothers have great relationships with their kids, or are happier as mothers than I am. I love my son, and we get along and have a lot of good adventures together, but there are times when I just don’t feel like a good mom. I also often compare myself to others when it comes to everything from church to money to accomplishments to appearance. Really, though, I just need to compare myself to me, and learn to be happy with who I am — as long as I continue to strive to be better. I also make it a point to try to remind myself that some people do like me. I don’t always feel very likable, and I know for a fact that there are loads of people who don’t enjoy my company. I don’t need everyone to like me, though. I can remind myself that I have an awesome and supportive husband, and read words of encouragement from others. Seeing myself as those who care about me see me can be a big help. Of course, it’s not always easy to boost your self-confidence, no matter how hard you try. Overcoming your hangups requires a lot of work. Even when I try to improve my own self-confidence, I often find myself back in a funk. It’s an ongoing process. What do you think? 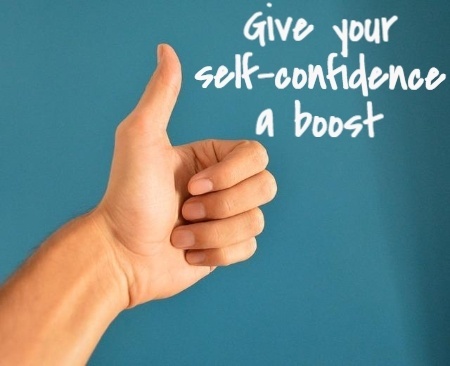 How do you boost your self-confidence?